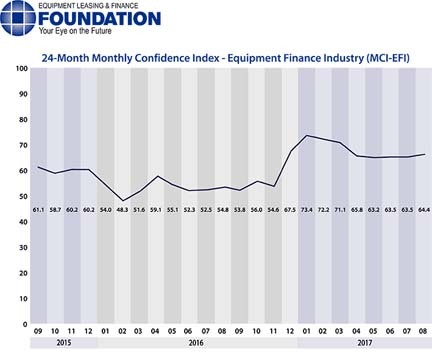 The Equipment Leasing & Finance Foundation (the Foundation) released the August 2017 Monthly Confidence Index for the Equipment Finance Industry (MCI-EFI) today. Designed to collect leadership data, the index reports a qualitative assessment of both the prevailing business conditions and expectations for the future as reported by key executives from the $1 trillion equipment finance sector. Overall, confidence in the equipment finance market is 64.4 in August, up from 63.5 the previous two months. The overall MCI-EFI is 64.4, up from 63.5 the previous two months. • When asked to assess their business conditions over the next four months, 38.2% of executives responding said they believe business conditions will improve over the next four months, an increase from 30.3% in July. 61.8% of respondents believe business conditions will remain the same over the next four months, a decrease from 69.7% in July. None believe business conditions will worsen, unchanged from the previous month. • 38.2% of survey respondents believe demand for leases and loans to fund capital expenditures (capex) will increase over the next four months, a decrease from 39.4% in July. 58.8% believe demand will “remain the same” during the same four-month time period, up from 57.6% the previous month. 2.9% believe demand will decline, relatively unchanged from 3% who believed so in July. • 17.7% of the respondents expect more access to capital to fund equipment acquisitions over the next four months, up from 15.2% in July. 82.4% of executives indicate they expect the “same” access to capital to fund business, down from 84.9% last month. None expect “less” access to capital, unchanged from last month. • When asked, 41.2% of the executives report they expect to hire more employees over the next four months, an increase from 33.3% in July. 55.9% expect no change in headcount over the next four months, a decrease from 66.7% last month. 2.9% expect to hire fewer employees, an increase from none in July. • None of the leadership evaluate the current U.S. economy as “excellent,” unchanged from last month. 100% of the leadership evaluate the current U.S. economy as “fair,” and none evaluate it as “poor,” both also unchanged from July. • 23.5% of the survey respondents believe that U.S. economic conditions will get “better” over the next six months, a decrease from 24.2% in July. 76.5% of survey respondents indicate they believe the U.S. economy will “stay the same” over the next six months, an increase from 75.8% the previous month. None believe economic conditions in the U.S. will worsen over the next six months, unchanged from last month. • In August, 38.2% of respondents indicate they believe their company will increase spending on business development activities during the next six months, an increase from 36.6% in July. 58.8% believe there will be “no change” in business development spending, down from 63.6% the previous month. 2.9% believe there will be a decrease in spending, an increase from none last month.